Why Does Congress want me to Shun my Local Bookstore and Shop Online Instead? Portland, Maine — It’s always a relief this time of year to find that my local bookstore has emerged from the crucial holiday retail season still standing. Longfellow Books, named after Portland’s famous 19th century poet, is the only bookstore selling new, general-interest titles left in this small city. I can hardly imagine getting through Maine’s long winter months deprived of its weekly author events or the pleasure of an hour spent browsing the latest staff picks. 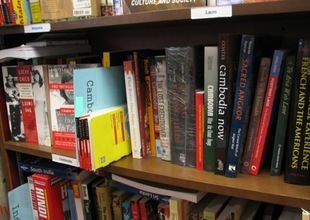 Longfellow Books nourishes Portland’s cultural life and also its economy. The store anchors a key downtown block, has helped many a budding local author, and provides a livelihood for six of my fellow Portlanders. All of this makes it hard to understand Congress’s long-standing policy of steering customers away from Longfellow Books by providing a substantial financial incentive to shop at Amazon instead. Like all bricks-and-mortar stores, Longfellow Books is required to collect Maine’s 5 percent sales tax. Amazon.com is not. Five percent is a titanic advantage in the thin-margined world of retailing. It’s worse in other states like California, where Amazon’s government-bestowed competitive edge rises to nearly 10 percent. Over the years, there have been four primary arguments made in favor of this grossly inequitable policy. The first one dates to 1992, when the U.S. Supreme Court, mindful that 45 states and thousands of local jurisdictions levy sales taxes, ruled that requiring a catalog company to collect taxes in states where it has no physical presence would impose too much of a burden on interstate commerce. The Court, however, explicitly opened the door for Congress to conclude otherwise, noting that “the ultimate power” to decide the issue rested with lawmakers. Nearly 20 years later, technology has both radically expanded long-distance retailing and eliminated the concerns that underpinned the court’s decision. Today, software makes collecting sales taxes nationwide relatively simple. Even Amazon, whose CEO Jeff Bezos has complained that it would be “horrendously complicated” to collect sales taxes, in fact does so every day, seemingly effortlessly, for Target and other chains whose online stores it manages. The real reason for Amazon’s opposition to online sales taxes is more likely that it loathes the idea of giving up such a sizable competitive advantage. The only group for whom collecting sales taxes might still pose a genuine impediment are small online sellers who lack the wherewithal to install the latest software. But proposals to extend sales tax collection to online retailers have all exempted small firms, typically defined as those with up to $5 million a year in revenue. Another argument, frequently heard in late 1990s when Congress first took up this issue, was that the fledgling world of e-commerce, so novel to shoppers, deserved coddling. But that argument has little bearing today. Even amid a major recession, online shopping is growing by double-digits. Amazon, which posted sales of $19 billion in 2008, is now the nation’s 19thth largest retailer. Lately, supporters of Amazon’s privileged status have tried to dodge the fairness question and recast this as a debate over a new tax. The Wall Street Journal editorial page insists that the issue boils down to nothing more than an attempted “money grab” by greedy state governments always on the lookout for new things to tax. But this is not a new tax. Online shoppers still owe sales taxes. In most states, they are supposed to remit them on their income tax returns. But rare is the person who does and it’s impossible to enforce. That’s why states made retailers tax collectors in the first place. The real issue here is a level playing field. One can argue that no retailer should have to collect sales taxes, or even that we should abolish sales taxes altogether. But those are both different debates than what’s at issue here. So long as we have sales taxes, all retailers ought to be under the same obligation to collect them. Indeed, anti-government free-marketers like the Wall Street Journal ought to be especially riled by a tax policy that tips the scales in favor of some competitors over others. Yet another argument made by Amazon is that it does not use public services in states where it has no facilities and therefore should not have to collect taxes in those states. I beg to differ: my last Amazon delivery made it to my house thanks to roads built and policed by local government. More to the point, it’s not Amazon that pays the tax, but the customer, who does indeed use local and state services. Tired of waiting for Congress, some states are finally moving on their own. In New York, a new law says that online retailers have a physical presence in the state, and thus must collect sales taxes, if they have in-state sales affiliates that drive at least $10,000 a year in revenue. The law, which has been challenged by Amazon and Overstock, but upheld by the courts so far, affects about 30 retailers and is expected to generate about $65 million in 2010. North Carolina and Rhode Island have now adopted similar policies. More states should follow suit, especially those, like California, that not only impose a high sales tax on local retailers, but have gaping budget deficits and staggering unemployment – neither of which is helped by a policy that favors out-of-state corporations. If more states act, perhaps it will finally prompt Congress to make a level playing field the law of the land. In failing to do so, year after year, lawmakers give a sharp elbow to Longfellow Books and the thousands of other local businesses that create jobs, enliven our communities, and deserve a fair chance to compete.